Sixty-one years. Three wars. Volunteered for service in 1943 despite the fact that his wife and two children were rounded up and thrown in an internment camp. Fought with the 442nd Regimental Combat Team in Europe as part of an anti-tank gun company. Earned the CIB. Returned home and stayed in the reserves, served in Korea and Vietnam as a military intelligence NCO. Incidentally, while he was in Korea, his son was fighting to hold the Pusan Perimeter with his brother Soldiers. Died of stomach cancer in 1967, An American patriot to his core. For one weekend every year since 1957, the skies over Chino, California fill with the sights and sounds of World War II aircraft. Nestled on an old Army Air Force base where the likes of 24 kill ace Gerald R. Johnson once trained, hosts this incredible event as one of its main fund raisers. These days, lucky visitors to Chino can see upwards of forty warbirds thunder overhead. It is an awe-inspiring sight. My dad found the museum one day in the mid-1950s. He was out driving around with his best friend from high school and looked over to see a Messerschmitt Me-262 jet fighter just sitting in a field. Both boys had grown up on the Southern California coast during the war and had fallen in love with aircraft as they watched F4U Corsairs and P-38 Lightnings zooming over their homes. A Corsair even crash landed in front of my dad’s place on the Balboa Peninsula in 1945. So of course, they stopped. The museum back then was basically a field full of WWII aircraft discarded by the military and somehow acquired by the founder of Planes of Fame, Ed Maloney. One plane, a Japanese J2M Raiden fighter, had been a plaything for local kids at Griffith Park in Los Angeles before Ed acquired it. Rumor has it that some thief had pulled the seat out of it and pawned it, and Ed had to go to the shop and pay $50.00 to get it out of hock and re-install it in this incredibly rare warbird. Back then, you paid a quarter at a tent that denoted the museum’s entrance, then walked through part of a bomber’s fuselage to enter the field of warbirds. As a kid living in the Silicon Valley, my dad would sometimes take me down to the Chino air shows. I still have snapshots I took in the 1970s with a 126 instamatic camera of the museum’s A6M5 Zero that had been captured on Saipan’s Aslito Field in 1944. Years later, while in graduate school at the University of Oregon, I discovered my landlady had been in charge of checking in and documenting captured Japanese aircraft as they arrived in Southern California. Quite possibly the initial paperwork the U.S. Navy generated on the Planes of Fame Zero had been filled out by Marge Goodman. Anyway, the trips down to Chino became a father-son thing for us Brunings. In 1986, we stopped going. I left for college that fall, and as graduate school and a career up in Oregon dominated my time, the chance to get to Planes of Fame became a pipe dream. Then came marriage, two kids and a new career as a military historian and writer. Finally, after I came home from Afghanistan, we revived the tradition. Five of the last seven years, we’ve road tripped down to Chino for the air show. In 2013, we brought my son and made it a tri-generational road trip. This year, my dad and I returned and spent the weekend out at the Chino Airport, amazed and inspired by the thousands who turned out to see the old birds fly. World War II is slipping from modern memory as the few remaining veterans of it pass. It won’t be long before we won’t have anyone alive who experienced the war at all. But thanks to Planes of Fame, the visceral sensation, the raw power and speed of the planes our grandparents flew in defense of our nation will endure and live in the memories of succeeding generations. Ed Maloney was a visionary, and thanks to his aircraft rescue efforts long before anyone saw value in those aluminum bodies, the sounds and sights of these amazing machines will continue to fill the skies over Southern California for years to come. It is a truly special place. If you love aircraft, make a point of coming here someday. You won’t be disappointed. You’ll be in the heart of the warbirds community. Below are some more photos I took this weekend at the 60th Planes of Fame air show. The Planes of Fame P-38J Lightning in 475th Fighter Group ace Parry Dahl’s markings. Pilot Chris Fahey at the controls of the POF P-38. The sound of this plane’s twin Allison engines is like crack to your friendly writer. After spending nine years researching and writing a biography on P-38 ace Col. Gerald R. Johnson, this aircraft became very dear to my heart. In the 90’s, I interviewed a lot of men who flew them in New Guinea and the Philippines during the war, and they swore by its firepower, range, speed and one-engined flight abilities. Mark Foster at the controls of this beautiful P-51 Mustang. It wears the markings of the 357th Fighter Group, a crack 8th Air Force unit that included Chuck Yeager and ace Bud Anderson. The Planes of Fame B-25 Mitchell making a pass over the Chino airport. This bird’s been used as a photographic aircraft for various aerial scenes in movies for several decades. After writing Pappy Gunn’s story in Indestructible, the side pack .50 caliber machine guns endear this bird to me. Every time I see it fly, I think the spirit of Pappy Gunn flies with it. A Red Air Force Yak prepares for a flight with the Korean War demonstration part of the air show. This year’s show included this stunning bird, a Consolidated PB4Y2 Privateer U.S. Navy patrol bomber. I’d never seen a PB4Y in flight before. The first pass it made during the airshow left me absolutely speechless. Loud, slow and huge, the plane is a dominating presence. I checked my Fitbit after it thundered by and saw my heart rate was at 150. I got credit for cardio, so props to the pilots for bringing on the work-out inducing excitement in their low-altitude passes. When I was in 3rd grade, my Uncle Dean gave me a book for my birthday entitled, “Greatest Fighter Missions of the Top Navy and Marine Aces.” I read it in a recliner next to the T.V. for hours every night after school. I still have it, though it is beat up and missing its dust jacket. One of the chapters is called, “Trapped By Zekes at Rabaul” and details one of ace Ike Kepford’s most harrowing missions in the South Pacific. This weekend, a Corsair in Kepford’s markings went blasting past me, and I was taken instantly back to those nights curled up in that 70’s-era chair, engrossed by Edward Sims’ recounting of Ike’s miraculous escape from pursuing Japanese fighters. Morning on the flight line, Saturday’s sunrise shoot. Steve Hinton piloting an F4U in Korean War markings from VMF-214’s 1950-51 deployment. The only place I know of where you can see two Japanese A6M Zero fighters fly. The bottom one is Planes of Fame’s Saipan Zeke. Photo of the Day: A Moment on the Western Front, 1918. U.S. machine gun team, Western Front, France 1918. 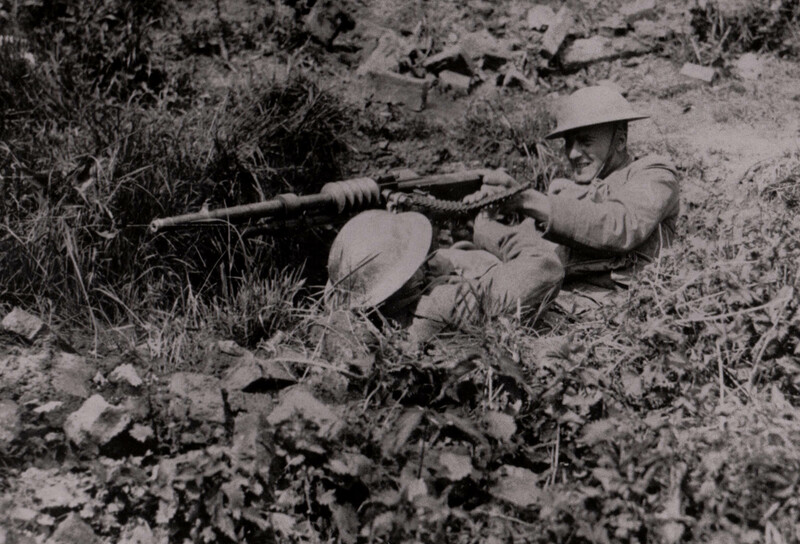 The men are manning a French Hotchkiss M1914 machine gun chambered for the 8mm Lebel cartridge. 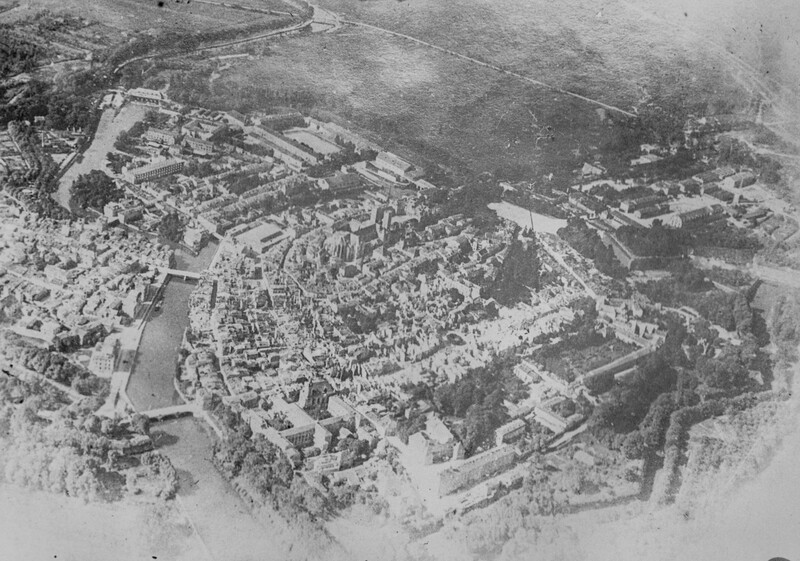 Aerial view of Verdun, 1916. In February 1916, the German Army unleashed a surprise offensive against the French defenders in the Verdun sector of the Western Front. Verdun was one of the fortress cities built by the French after the 1871 war. In the rolling hills around the town, a series of reinforced concrete and underground forts had been built. Heavily protected, extremely well armed with such innovations as retracting gun turrets, the Verdun forts were supposed to break up any German offensive, or at least stall it long enough for the army to counter-attack. 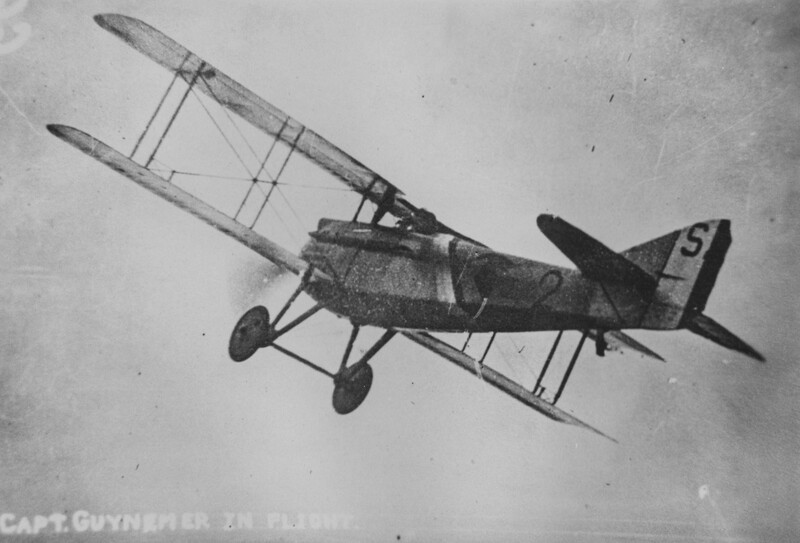 French military aviation came of age at Verdun, and the fighting there produced such fighter legends as Jean Navarre and Charles Guynemer. But after the Germans took out the Belgian forts at Liege so quickly in 1914, the French Army assumed the day of the massive concrete fort had come and gone. Now, thanks to modern heavy artillery, almost any defensive structure could be pummeled to ruins before any troops had to be sent in to occupy it. As a result of that conclusion, the French stripped the forts around Verdun, sending the garrisons and much of the artillery into the front lines elsewhere on the Western Front. Nevertheless, the forts remained a source of considerable national pride, something that the Germans were counting on that February. The idea behind the German offensive was not necessarily to capture ground, but rather to force the French Army to defend a region considered vital to France’s national morale. If the vaunted impregnable fortress Verdun could fall, how could the Germans be stopped? So, the Germans counted on the French throwing everything they could spare into the defense of Verdun, and when they did, they would bleed the Gaulic army white with massed artillery bombardments, gas attacks and limited infantry assaults, heavily supported by machine guns and the new flamethrowers just arriving in the front line German units. That was the rational anyway. The German offensive began with one of the most intense artillery barrages in human history. The French front lines were almost totally destroyed by the shelling, and the initial waves of German infantry pushed deep into French territory. But as the French Army reacted and threw in reinforcements, the lines gradually hardened again. Repeated French counter-attacks slowed the Germans, but came at such a cost that some divisions lasted only a few days in the battle before they had to be pulled out and reformed. Losses ran over sixty percent in those units, and in others, entire companies were swallowed up in the inferno. 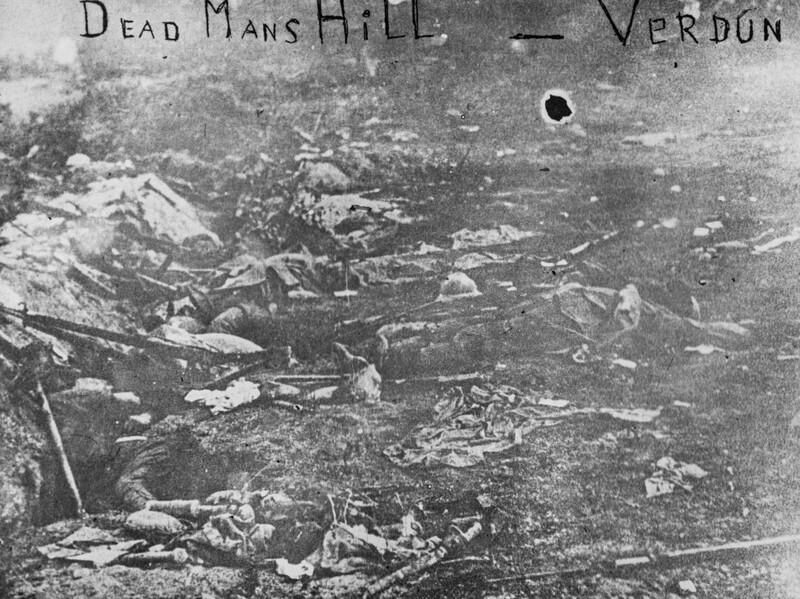 The Morte Homme, a small hill and ridge that was the scene of heavy fighting, became one of the symbolic points of French resistance at Verdun. 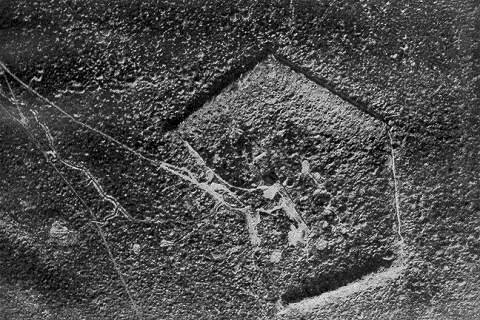 The Germans scored a huge propaganda victory when a small group of their soldiers captured the most modern of the Verdun Forts, Douaumont, by a coup de main. The truth was, there was only a tiny French garrison left inside the fort, and once the Germans found a way inside, the place was doomed to fall. But, lesson learned. After that, the French Army resupplied and reinforced the remaining forts. The offensive continued with both sides throwing fresh troops into the fray. The battle became less about the ground and more about the spirit and resolve of each nation. Both sides and staked their prestige and national pride on the outcome, though ultimately Verdun had much more importance in the French psyche than the German. Ultimately, an offensive designed with one objective: kill as many French soldiers as possible, became a test of national will. The French committed an entire generation of its young men to the defense of Verdun. Well over half of the French Army passed through the salient during the 1916 campaign, and more than any other WWI battle, it left an indelible mark on France’s soldiers. They fought in mud and water-filled trenches and shell craters, living among the rotting remains of the dead. Scavengers–birds, rats, feral dogs–fed off those remains in No Man’s Land, and veterans later wrote how the corpses splayed between the lines would sometimes twitch and jerk as animals ate them from the inside out. The medical logistical system never kept pace with the flow of wounded. Men writhed for hours, sometimes days unattended where they fell as they waited for stretcher bearers to come relieve their suffering. But even then, they faced hours of travel to the nearest aid station, where the wounded were laid out often without protection from the elements as overwhelmed surgeons did what they could. Gas gangrene, infection, pneumonia and shock claimed countless victims. Those who survived were scarred forever by the sights, smells and sounds of those facilities. As Verdun became a carnival of horrors, the vitality of the French Army was pulverized in its killing grounds. And yet, the French troops continued to fight with near suicidal determination. In July, 1916, the Germans surrounded Fort Vaux, one of the last of the remaining fixed emplacements defending Verdun. For a week, Fort Vaux’s defenders held out against staggering odds. They fought the Germans corridor to corridor in darkened, underground passageways. The Germans used gas, bayonets and grenades to clear the fort gallery by gallery. The dead stacked up, and the French survivors took to drinking their own urine to slake their thirst after the Germans captured Vaux’s water supply. When the fort’s commander, Colonel Raynal, finally surrendered his battered force after a week of furious fighting, the Germans were so taken by his stout defense that they allowed him to carry his sword into captivity. 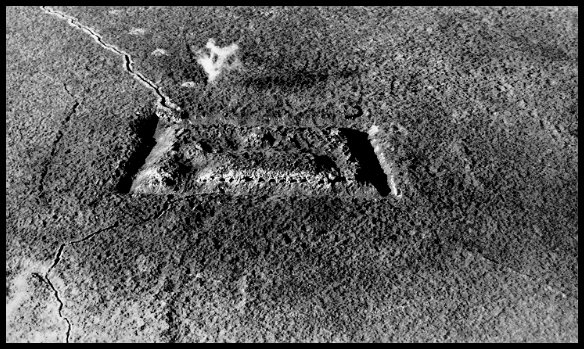 Aerial view of Fort Vaux and the thousands of shell craters that pockmarked the terrain around it. By late summer, the German offensives had played out, and they could not devote anymore troops to the Verdun Sector as a result of the British offensive along the Somme River. The French mustered their reserves and wrested the initiative from the Germans with a series of bold attacks that recaptured almost all the ground lost earlier in the year. The French had won the Battle of Verdun, but it had cost them the soul of a generation. Men, no matter how motivated, well-trained and patriotic, will always have a breaking point, and the brutal losses and psychological trauma of Verdun pushed the French Army to the breaking point. After a failed offensive in April 1917, much of the French Army mutinied in their trenches. Order was restored by June, thanks to Marshal Petain, but the French Army would never be the same again. To understand the French Army of World War II, Indo-China and Algeria, one first has to understand the impact Verdun had on the nation and its fighting men. They’d saved the Republic, but mortgaged the future to do it. And the land around Verdun reflected the damage done to the nation. Endless fields of shell craters, one atop the other, still bear silent testimony to the ferocity of the artillery bombardments. The shelling destroyed much of the top soil, and for years little would grow on those battlefields. It took a national reforestation program to change that. Farmers still encounter human remains. Some are taken to the Ossuary at Verdun, where visitors can see through glass windows the bones of thousands of unknown soldiers–French, German and (later in 1918) American. I was there in 1984 and peered in through the glass. The sight changed my own life forever. Something like 550,000 French Soldiers are known to have been killed or wounded, or went missing during the Battle of Verdun. The Germans lost at least 430,000. About eight million French males served in the army between 1914-18. Of those, almost 1.4 million were killed, and 4.2 million wounded severely. It has been estimated that 90% of all French men between the ages of 18 and 24 either died during the war, or came home with debilitating physical wounds. A generation lost to the defense of a nation. America has never known such a complete and devastating sacrifice. Here is to hoping we never will.